When selecting the shared web hosting package with HostRocket, we were expecting to see a similar format to most other website hosting companies; within each package, there would be several plans. Many of HostRocket’s features are unlimited, such as, storage space, bandwidth, domains, databases, and FTP accounts, with free site backups via the cPanel. However, we were not going to miss the ‘add on services’ that were safely tucked away at the bottom of the pricing page which state you can add these services to existing accounts, where you have to contact customer support to do so. HostRocket’s pricing method is very different to other competitors, and although the monthly prices aren’t extortionate, there are a couple of things to be mindful of. Firstly, with most other competitors, domain registration is a free feature, whereas you’ll be looking to splash out $20 per year for this luxury with HostRocket. Secondly, in order to obtain an SSL certificate, which is charged at $99 per 2 years (currently that price is with 50% off), you are required to have a dedicated IP address, which is another $2 per month with HostRocket. HostRocket’s other packages include an SSD shared hosting plan starting at $9.98/mo for 5GB SSD storage, to $18.98/mo for 40GB SSD storage. 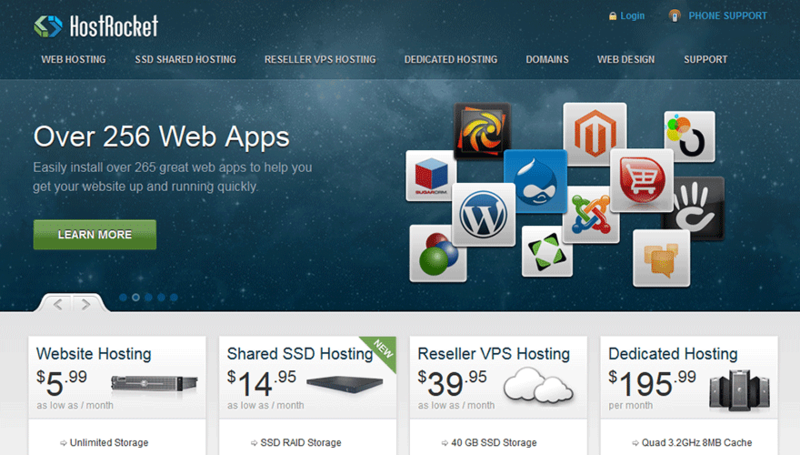 Their reseller VPS hosting starts at $9.95 for 1GB RAM, 20GB SSD storage, and 500GB bandwidth with the option to add on cPanel from $14.95/mo. Frankly, the features you get with their VPS hosting packages cannot be compared to other hosting providers. We are familiar with providers offering unlimited bandwidth, storage, including cPanel for $19.99/mo, we think that says it all really. HostRocket give their customers the ability to choose from two data centres within the U.S. which may sound appealing if you are hosting a website in one location, catering to customers in another location. HostRocket’s data centres locations are based in Chicago and New York which are 714 miles apart; perhaps in theory this would appear to be a beneficial feature, but in reality, it’s really not. HostRocket offer over 250 app integrations with their server hosting, covering a wide range of categories, such as, WordPress, Magento, Zen Cart, Forums, and more. As well as their easy to install apps, they also have a Site Builder which is an online site building tool, allowing you to select from a large portfolio of templates. HostRocket, as part of their features, offer a 99.5% uptime guarantee. It’s great to have guarantees from web hosting providers, especially when it comes to uptime, but at 99.5%, this type of guarantee is almost not worthwhile. Most other competitors will offer 99.9% uptime guarantee, and although it may not seem like a lot, that percentage difference will be noticeable when your website cannot be accessed. We checked out HostRocket’s uptime report since 2005 to see how well they had actually been performing. Their overall uptime sat at 99.689%, and has been at a steady 100% for the last 5 years, which is reassuring. However, if HostRocket know they’ve been performing well, it seemed odd to us why they wouldn’t increase their uptime guarantee to reassure their customers. Following our disappointment in HostRocket’s uptime record, we wanted to know what others thought about this, and whether their customers were happy. You can contact HostRocket’s customer support via their ticket system, of via telephone on their toll-free number which is available for U.S. customers only. HostRocket claim to be on hand 24/7 and say “as a general rule all problems can be handled satisfactorily via our trouble ticket system”. Although the support methods for HostRocket aren’t brilliant, and admittedly we felt troubled by this, we submitted several tickets that were responded to within 10-15 minutes later. All of the replies we received were helpful and their support staff appeared very knowledgeable. Reviews and reports from other customers provide a general consensus that HostRocket’s support is fairly decent overall, with no major complaints in this area. Perhaps if you’re beginning your website journey and you have the budget to purchase HostRocket’s pricing plans, and like the website templates they offer, then they may be a viable option. HostRocket provide a relatively decent speed, with potentially better than average customer support, and an average uptime. However, in a nutshell, we find HostRocket to be, simply average. Compared to other competitors such as eHost, we cannot justify spending the money each month that HostRocket are asking for; their features are merely average compared to their prices, and most require you to spend extra, on top of the already expensive plans.